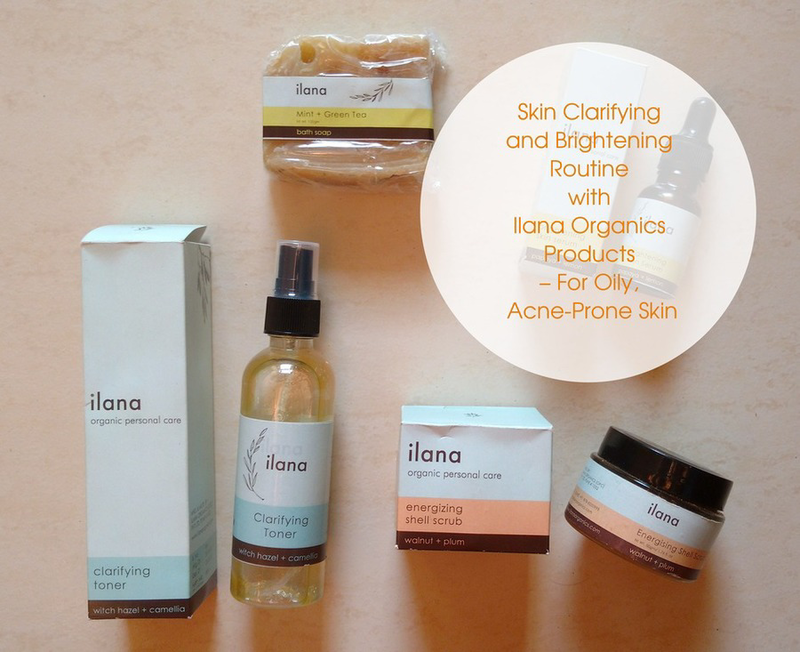 In my journey of discovering natural and organic beauty brands, I recently came across a new brand on Insta called Ilana Organics. Right from their packaging to their philosophy and no-nonsense ingredients list, everything seemed alluring. Currently, I wouldn’t say my skin is in a bad condition (thanks to using organic, natural products consistently 😊). But I do have some acne scars, pigmentation, uneven skin tone and dullness. And I do have 2-3 active acne. These are the skin concerns am currently working on the path to glass skin. And am sure its the same problems with many of you guys. When I mentioned these concerns to the brand, they had sent me their specific set of products meant for clarifying and brightening skin. I have started incorporating these in my skincare routine. I have been using them for a week and I can already see some difference. I will come up with detailed reviews and final results after two weeks of using. But meanwhile, I would like to share the Clarifying and Brightening Skincare Routine that am following currently and why it is so potent. Though its recommended not to use soaps for face and use only face washes, this one is a 100% natural, cold-pressed soap. Its very gentle on the skin. Green Tea and Mint are both good for oily and acne-prone skin. Green Tea is rich in catechins which are anti-microbial and help destroy acne-causing bacteria. It also helps to flush out the skin toxins and impurities. Mint leaves contain a high amount of salicylic acid which loosens dead skin cells and allows them to shed easier. This results in acne scars fading and leaves skin clearer. Toning is an essential part if you have oily, acne-prone skin. And witch hazel is a natural astringent which helps to remove excess oil and tighten pores. Camellia (white tea) helps to calm down inflammation and redness. Also, this clarifying toner contains tea tree, apple cider vinegar, lemon and lavender which are excellent for acne-prone skin. After toning, it is treatment time. This serum from Ilana Organics is a potent botanical formula to brighten skin and also work on pigmentation and acne scars. It contains papaya seed oil, lemon essential oil which add glow and radiance to the skin. And also geranium oil which rejuvenates the skin. With regular use, it also helps to fade dark spots and dark circles. The instructions say it starts showing results within two weeks of usage. This is a slightly rich lotion and if you have very oily, acne-prone skin, you can go for their other variant, Ilana Organics Clarifying Skin Serum Argan + Tea Tree. Along with using the above three products daily, it is recommended to use this scrub twice or thrice a week. It comes in powder form and you can mix with rose water, milk or yogurt. This is an energizing and awakening micro exoliator made entirely from fruit shells and peels. It aids cell renewal, turnover and works on uneven skin tone and keeps acne at bay. This does sound like a promising range for clarifying and brightening skin. Am following this currently and will update you in detail after one week. Hope you found this post useful. Do subscribe to my blog to get know about latest natural, organic brands. Take care, bye! Amazing routine, would love trying their products! !